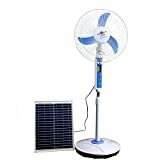 ★[Speed Adjustment]: The Cowin Solar Fan comes with 3 different speed modes with a low speed mode of 1000 RPM and a high speed mode of 1350 RPM. ★[AC and DC Power Capability]: The Solar Fan can be powered and charged by DC power from 15W solar panel. In the event of little or no sunlight, or no charge, the fan can be charged through AC power adapter, which comes with the fan. Our fan is built with a rechargeable battery that comes with overcharge/discharge protection. ★[Efficient Delivery and 1 Year Warranty]: Seller fulfillment delivery time: 3-7 days, FBA will be more efficient.1 year warranty is included. ★QUALITY ASSURED: We want to make you happy, if any products problem,pls contact us, we'll provide a full refund if you're not 100% satisfied with our solar fan.